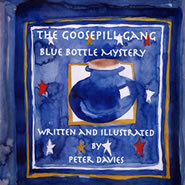 The Goosepill Gang - Blue Bottle Mystery was written and illustrated by Peter Davies and published via Upfront Publishing. We are always pleased to hear from our readers and welcome your comments regarding our book and our online service. Sanderstead, Surrey, England, CR2 0RE.